After scoring one of the world’s most coveted jobs, Western Australia’s newly crowned “taste master” 34-year-old British father, food blogger and musician Rich Keam is excited to explore the state, perhaps with the odd pale ale at hand. The job was one of several jobs up for offer as part of Tourism Australia’s Best Jobs in the World campaign, launched three and a half months ago. Mr Keam bagged the title on Friday, after competing against two finalists from the USA and Germany and beating 90,000 applicants for the job. 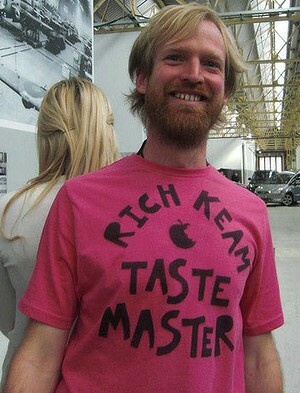 Rich Keam is WA’s new taste master. His $100,000 role will see him eat and drink his way around the state for six months, promoting WA to the rest of the world. The foodie says he is “gobsmacked” to have been given the responsibility. But as someone who is a “keen traveller, enjoys meeting people and recording his experiences” – he is the right man for the gig. “It was such tough competition but I think it was my creativity, enthusiasm and communication skills that stood out… I also think that my online content is what people will want to watch and read and say ‘Yes! I want to do that! '” Mr Keam said. In WA for the finalists’ challenge, he has already eaten in some of the state’s top restaurants and enjoyed Little Creature’s pale ale, which reminded him of the ale he drinks a lot of in his hometown of Brighton. “Perth actually reminds me quite a lot of Brighton, and vice-versa. You can really feel the art and music seen around the city and it looks like something that is only going to get better,” he said. In a few months time Mr Keam’s fiancée and his five-month-old boy will meet up with him, to share his journey as a family. Mr Keam says he would recommend others getting “out there” – just as he did when he first visited Australia for a year when he was 20. “The trip changed me as a person, it was the best experience,” he said. Keep all your senses open – everything you can feel, hear, smell and see. Try everything and live in the moment. The ‘Best Jobs in the World’ campaign was a collaboration between Tourism Australia, Tourism WA and five other State and Territory tourism organisations. The other five winners are American Andrew Smith (chief funster, NSW), Brazilian Roberto Seba (lifestyle photographer, Victoria), Frenchwoman Elisa Detrez (park ranger, Queensland), Allan Dixon (outback adventurer, Northern Territory) and Canadian Greg Snell (wildlife caretaker, South Australia). There were no Chinese or other Asians among the winners, perhaps a surprise given China’s dominant presence in world tourism. But Tourism Australia said that while the level of interest and quality of entries from South-East Asia were high, they were not strong enough to win. Tourism Australia reports show that Taiwan and South Korea are among the top five countries for Australian working holiday maker visas, alongside the UK, Germany and France. A Tourism Australia survey revealed that 72 per cent of people who entered the competition were planning to apply for an Australian working holiday visa, with 39 per cent seriously considering taking a working holiday within the next six months. This entry was posted on Friday, June 21st, 2013 at 8:58 am and is filed under EMPLOYMENT, PEOPLE, TOURISM & ACCOMMODATION. You can follow any responses to this entry through the RSS 2.0 feed. You can leave a response, or trackback from your own site. Created by miloIIIIVII | Log in | 82 queries. 34.288 seconds. | Entries RSS | Comments RSS.